I offer wildlife/ birdwatching tours to tropical rainforest and snorkeling tours in coral reefs of Manokwari, Tambrauw, Sorong and Raja Ampat in West Papua province of Indonesia. 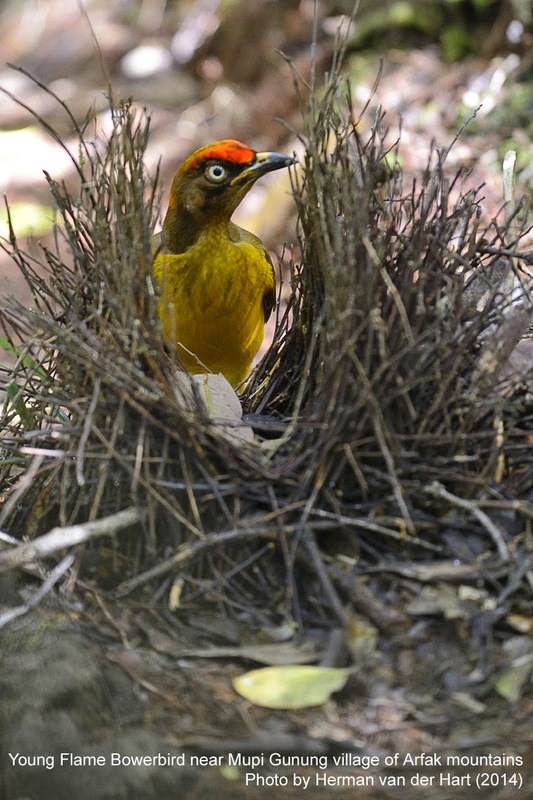 Manokwari regency has been famous as a birding tour destination for years. There are several places that I promote on the internet as recommended sites for birdwatchers. Lower Montane Forest of Susnguakti - Although this birding site is considered as lower montane forest, the trekking routes to the dancing ground of Lesser Birds of Paradise are very steep. Birdwatchers have to be fit to walk for 1.5 hours if they want to watch paradise birds in this area. It is located on the eastern slopes of Arfak mountains. Upper Montane Forest - Arfak mountains have been the most popular birding tour destination for visitors who want to watch Western Parotia, Vogelkop Bowerbird, Magnificent Birds of Paradise, Cinnamon Fruit Dove, Hooded Pitohui, Papua Mountain Pigeon, Brown sicklebill, Black sicklebill, Flame bowerbird and a lot more. The birding site that I highly recommend is Mupi Gunung. Mesirrokow river - This is one of the best birdwatching sites in Manokwari! I am serious about this. It is a highly recommended site for keen birders. The tropical rainforest in Manokwari are very nice place to watch pigeons and doves. I have guided a lot of birdwatchers on birding trips in both lowland and highland forest in the region. Today I will write a little bit about pigeons. The common name for pigeons in local language is Kumkum. The indigenous Papuan people hunt pigeons for their delicious meat. I introduce trekking and birdwatching trips in such areas as lowland forest of Arfak mountains and north coast of Manokwari to empower the local people in protecting the birds. During my birdwatching trips with international birders, we saw Pinon Imperial Pigeon, Western Crowned Pigeon, Great Cuckoo Dove, Beautiful Fruit Dove, Pink-spotted Fruit Dove. Doves have got similar appearances with pigeons. They usually find food near fruit trees or on clear grounds. 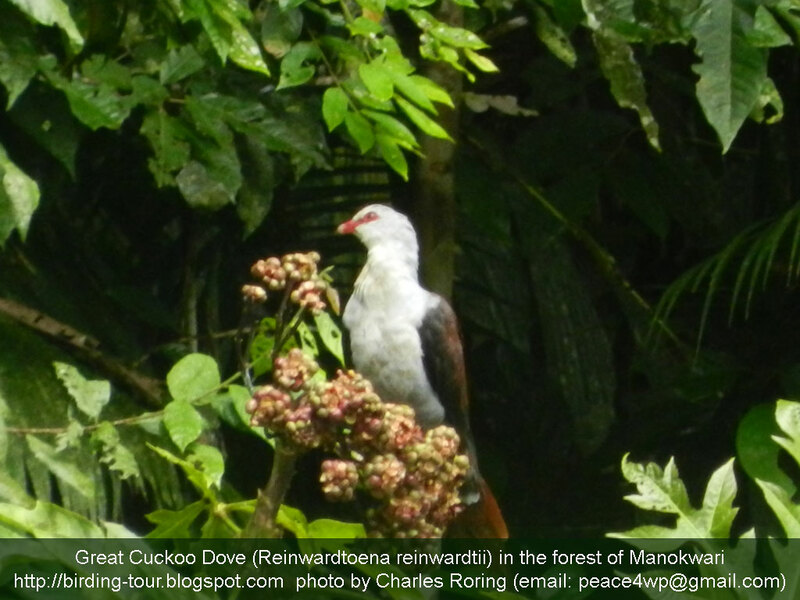 When I accompanied visitors in the jungle of Arfak mountains, we saw Cinnamon Ground Dove in the slope of Mt. Soyti. Birdwatchers usually bring binoculars and spotting scope to magnify the image of distant birds. For taking pictures, or making videos of the birds, professional birdwatchers use D-SLR camera with telephoto lens. For budget travelers, an affordable but powerful compact camera that is equipped with super zoom lenses will be a perfect choice. I highly recommend Sony HX300, Canon SX50, Nikon Coolpix P520, and Fujifilm Finepix SL1000.